New calibratable LED norm-light source available – go green! LacunaSolutions.com is a newcomer in the market of norm-light sources, it offers with its SmartLightningSystem the first LED based Norm-light source where not only the brightness but also the color temperature can be controlled! The innovative Norm-light solution, which has been developed by the company in its entirety, is based on a combination of 6 different LEDs in one “light board”, a hardware controller and software. The software is available for Mac OS X, Windows and Linux and will set any color temperature between 3500 and 12000 Kelvin , UV-Content and a luminance up to 2200 Lux, achieving its goal precisely using a common spectrometer. The system generates the chosen illuminant, using a warm white, cold white, blue, green, violet and UV (360nm) LED. In contrast to common fluorescent tubes a much more harmonic and complete spectrum is created (see graph) which leads to a more natural and more even color representation. The graph shows an example, the intensity of the spectral components can be adjusted continuously. The color rendition is far better than with conventional neon light technology or so called HighPower/High CRI LEDs. There is also no more need for a hybrid system that mixes two different light sources. By using a 400nm and a 360nm UV LED the system achieves the old as well as the new ISO standard 3664. The UV components can even be altered in intensity. Changing tubes or waiting for them to warm up is a thing of the past. There is also no more need for the purchase of several different viewing booths for different color temperatures. Besides the classic usage in the graphic arts or at the retouching workstation there are new possibilities for this light source. LacunaSolutions has successfully tested the system as “photo lights” for product and portrait photography. Initial tests at dental laboratories, instrument builders and art restoration showed the superior light quality and color fidelity of the system in color critical applications. Especially the SLS-Monitor could mean the breakthrough for soft proofing technologies. “Light means color” – without a Norm-light a high quality and color correct simulation of print colors on the monitor is not possible. Because the “light hood” can be easily adjusted in width to fit 23 to 27 inch monitors it is the perfect addition to a high quality – preferably hardware calibratable – monitor. The first software manufacturer to integrate the support of the SmartLightning System into its soft proofing system is Remote Director, in order to control all the lighting conditions. For users of other systems (Adobe Photoshop, Artcom, etc.) they can achieve the same goal with the included “SmartLightning System” software. This software even allows a visual comparison, so that you can decide whether you want to adjust the white point of the monitor to the light or the light to monitor. In this scenario you can either use the “light hood” or the overhead fixture. According to the Fogra-Expertise Nr. 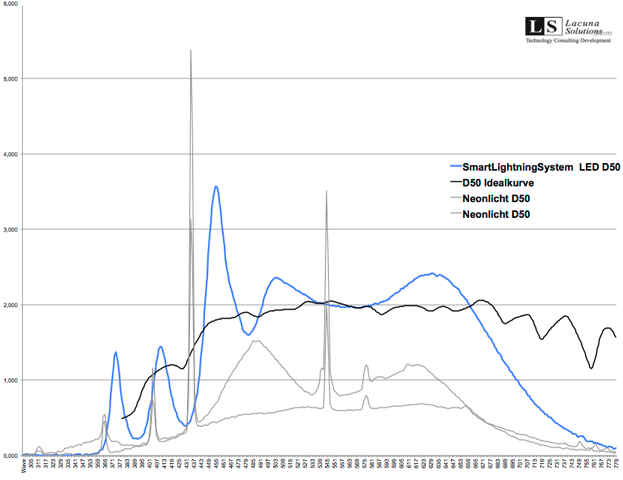 24863 we are happy to announce ISO 3664 compatibility for our LED based daylight system. Our SmartLightningSystem matches for condition “P1″ and “P2″. The investment in a Norm-light system is well worth it, because you can avoid mistakes during the production, you have new possibilities for quality control and the system will serve you for many years to come. In the end you will just save money with it. Follow the path of the light and try out new ways with us … test our solution.